Sechs Monate nach dem Mord an der honduranischen Umweltschützerin Berta Cáceres ist ihr Mord weiterhin ungesühnt. Schlimmer noch: ihre Mörder werden von der honduranischen Justiz nicht einmal strafrechtlich verfolgt. Um auf diesen Zustand aufmerksam zu machen fanden am 2. September weltweit Protestaktionen statt. Pro REGENWALD war gemeinsam mit dem Ökumenischen Büro für eine Mahnwache vor der Siemens-Zentrale in München, da Siemens über sein Joint Ventura Voith Hydro Zulieferer u.a. für Turbinen des Staudammprojekts Agua Zarca in Honduras ist. 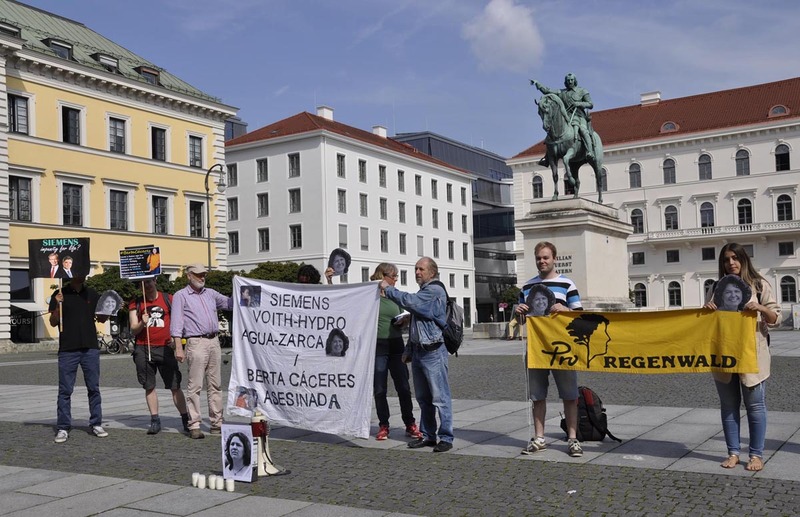 Der Protest der lokalen Bevölkerung gegen dieses Projekt wurde von massiven Menschenrechtsverletzungen begleitet und führte letztlich zur Ermordung von Berta Cáceres. Die beteiligten Unternehmen - auch Siemens und Voith Hydro - ignorierten diese Menschenrechtsverletzungen jahrelang. Und obwohl das Kraftwerksunternehmen DESA und das honduranische Militär offensichtlich in die Ermordung verwickelt sind Hintergrund: Ermordung angeordnet verweigert sich die honduranische Regierung den Rufen nach der Einsetzung einer unabhängigen internationalen ExpertInnen-Kommission zur Aufklärung des Mordes. Die deutsche Bundesregierung fördert diese Haltung der Regierung noch, indem sie die Einsetzung einer solchen Kommission bisher nicht unterstützt. Wir fordern die Bundesregierung auf, ihre Haltung zu ändern und aktiv darauf hinzuwirken, dass sich die Verhältnisse in Honduras zum besseren wenden. Denn noch ist Honduras eines der gefährlichsten Länder für Menschen, die sich für Umweltschutz und Menschenrechte einsetzen. Honduras still a death trap for environmental activists six months after Berta Cáceres’ slaying * Erika Guevara-Rosas, Erika Guevara-Rosas is Americas Director at Amnesty International. LONDON, Sep 1 2016 (IPS) - Chills ran down Tomás Gómez Membreño’s spine when he first heard about the brutal murder of his renowned friend and ally, the Honduran Indigenous leader Berta Cáceres, six months ago this week. Berta’s work was widely and globally acclaimed and had earned her international awards if someone could violate the sanctuary of her home and shoot her dead, it was too frightening to contemplate what could happen to any of the country’s lesser-known human rights defenders. According to a recent survey by Global Witness, Honduras and neighbouring Guatemala have the two highest rates of murders of environmental activists per capita. 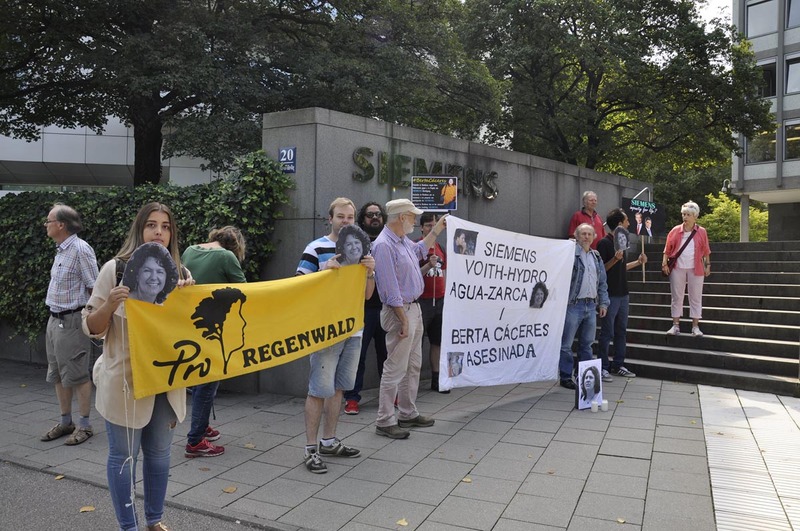 An astounding 65% (122 out of 185) of the murders of human rights defenders working on issues related to land, territory or the environment registered across the world in 2015 were from Latin America. Eight took place in Honduras and 10 in Guatemala alone. Berta’s killing marked a turning point for what was already a scandalous situation. But her tragic end was hardly surprising; it was a tragedy waiting to happen. 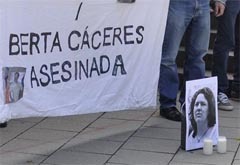 Months before her murder, she had reported a number of serious threats related to her outspoken opposition of the construction of the Agua Zarca dam in the community of Río Blanco, in north-western Honduras. The local Lenca Indigenous community complains that they were not properly consulted over a plan that would threaten the flow of the Gualcarque River, which is sacred to them and provides them with food and drinking water. COPINH says that if built, it would force the community to relocate as life in the area would become virtually impossible. But in resource-rich Honduras and Guatemala, it can be a deadly business to dare to defend natural resources that are highly valued in global commodity markets. Both Central American countries have become ever-more attractive to powerful extractive industries, partly due to increasingly lax laws governing what companies can and cannot do. Meanwhile local communities are continuously squeezed out of the lands on which their survival depends. The toxic cocktail of threats, bogus charges, smear campaigns, attacks, killings and crumbling judicial systems incapable of delivering justice has made the legitimate business of defending basic human rights a nearly impossible one. Crimes against activists are rarely properly investigated, which perpetuate further violence. The authorities often blame their country’s weak institutions for the shocking injustice, but conveniently fail to ignore the fact that the absolute lack of political will to protect and support these activists is often what puts them in mortal danger in the first place. After a great deal of international pressure, the Honduran government initiated an investigation into Berta’s murder and arrested five individuals but the process is still marred with question marks over its fairness and impartiality. 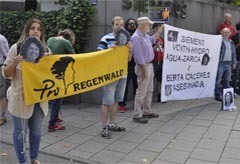 Meanwhile, members of COPINH and Berta’s lawyers continue to be threatened and harassed. Tomás fears for what can happen to those linked to Berta. Other activists are so afraid they do not even dare to speak their names in public or discuss the threats they routinely face for protecting basic human rights. But they say stopping their work is not an option. They are the last line of defence no-one else will defend their communities and rights. A country’s natural resources as well as the people who bravely protect them are among its most precious assets. This is not just for financial considerations. Without land to grow food or clean water to drink, entire communities will simply be erased without a trace. The solutions to this profound crisis are not simple, but they cannot be ignored. Investing time and resources in a much-needed overhaul of the Honduran and Guatemalan justice systems to ensure effective investigations into these crimes and putting in place proper protection for those at risk would go a long way to prevent the countries from losing more brave activists like Berta.